I am very pleased to announce that Mildred Kornman will be attending the upcoming Laurel and Hardywood Convention in Hollywood. Mildred will be traveling from her home in Utah to join in on the fun. Mildred Gene Kornman, aka Ricki VanDusen, one of the first supermodels of the fifties, is the sister of famed “Our Gang” member Mary Kornman. Mildred was born on July 10,1925 in Beverly Hills, California, just ten years after her sister Mary. “I was born in the front room of our house” she once proudly exclaimed. 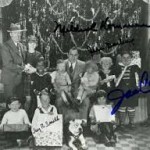 Their father, Gene, a professional photographer, had been working as a staff photographer at the Hal Roach Studio, where the “Our Gang” features were to be made. According to Mildred, there was no “Our Gang” before Gene’s arrival at the studio. Once Hal Roach had decided to commence with the series, Gene found the opportunity to secure Mary a role in the “Gang”. Mary would now begin her film career in 1922 and play under her own name through 1926. Gene Kornman had become the personal photographer to Harold Lloyd, the famous silent comic employed by Hal Roach Studios. 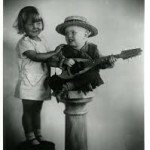 The friendship became so close that Gene had named Mildred after Harold Lloyd’s wife, Mildred Davis, who also stood as Mildred Kornman’s Godmother. Mildred’s middle name came from her father’s first name. The last name, Kornman, which is German, originally was spelled Kornmann. When Gene’s father came over to United States from Germany, he dropped the second “n” to “Americanize” his name. This was very common for immigrants of any nationality to do back then. Opportunity would now permit Gene to introduce Mildred into “Our Gang”. Mildred’s acting career would begin at age of one! As Mary was now becoming too old for the series, Jean Darling would soon join the production as Mary’s replacement. Just before that change in 1926, Mildred would join “Our Gang”, playing Joe Cobb’s sister. Her career with the series would last from 1926 thru 1935, appearing in such later episodes as “Little Sinner” 1935, and “Our Gang Follies of 1936”. 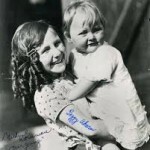 In fact Mildred would again appear in the infamous episode “Fish Hooky”, 1933, with her older sister Mary, who played the part of the school teacher, “Miss Kornman”. Mildred played along side of the some of the most memorable characters of the early “Our Gangers” such as Robert “Weezer” Hutchins, Allen”Farina” Hoskins, Johnny Downs, Mickey Daniels and don’t forget lovable Joe Cobb. One of my favorite scenes is from the “Our Gang” silent “Fourth Alarm”, available on the newly released “Little Rascals Collection” DVD set. In this episode Mary is holding baby Mildred while Joe Cobb tries to give “his sister”, Mildred, her medicine. This delightful scene of the sisters together strikes one as more of a Kornman home movie segment rather than a production made for theaters. This short happens to be Mildred’s favorite as she and Mary spend almost the whole episode on camera together. Mildred would later attend grammar school in Beverly Hills and then go on to attend Hollywood High School, graduating in 1943. At the age of 16, she began to do some freelance modeling to earn extra money for the family. These being the depression years, times were tough and everyone learned to pitch in. Mildred would then get married at age 18 and begin a career in films at 20th Century Fox under her new stage name of Ricki VanDusen. Ricki would appear in such movies as “Up In Arms” 1944, “Dolly Sisters” 1945 (available on VHS) with Betty Grable and June Harver, “Cinderella Jones” 1946, and “Diamond Horseshoe” 1945, also with Betty Grable. Ricki would eventually give birth to her second child, Darragh. It was after this that she would return to California and continue modeling while also commuting to New York. Later on, Ricki decided to merge her talents as a model with her business savvy so she opened up one of the most famous boutiques in Encino, California called “VanDusen Green”. But photography was always in the Kornman “Genes” and so Ricki would turn to the career that her father had so long pioneered. “I loved photography!” Ricki recently said. Now retired, Ricki (Mildred) enjoys a wonderful life of family and travel. Out of all of her accomplishments Mildred is most proud of her two children, son Stephen along with his children, Justin and Tiara, and daughter Darragh along with her children Vanessa, Vonn, and “the twins” Joanna and Alicia. It is without a doubt that the Kornman name will always be associated with the genesis of three of America’s most glamorous careers. Father Gene would pave the way for celebrity photographers yet to come. 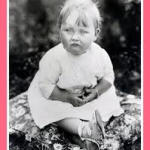 His daughter Mary would begin acting just as moving pictures were being introduced, becoming one of the first child movie stars. 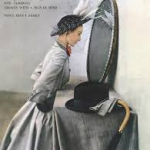 And daughter Mildred as “Ricki VanDusen” would be one of the first lovely women to adorn fashion magazines both inside and on the cover, when beauty and grace were the standards of the day. May I introduce you to one of the first Super Models “Ricki VanDusen”, America’s own Mildred Kornman!